On March 24, 1980, Oscar Romero, the Archbishop of San Salvador, was assassinated while saying mass at a chapel in that city because of his preaching the Gospel and denouncing the Salvadoran regime’s violations of the human rights of his people. Analyzing this statement first requires an examination of the Roman Catholic Church’s structure and procedures regarding beatification and of the history of the “cause” for such status for Romero. The bishop’s conclusion and documentation then is submitted to the CCS, which has 34 members (cardinals, archbishops and bishops), one promotor of the faith (prelate theologian), five relators, 83 consultants and a staff of 23; it is headed by Prefect Cardinal Angelo Amato. The CCS is charged with conducting a rigorous examination into the life and writings of an individual to determine if he or she demonstrates a heroic level of virtue or suffered martyrdom. A CCS member is appointed Postulator by the CCS to oversee all aspects of the cause at the congregational level. With the assistance of a member of the congregational staff (a Relator), the Postulator prepares the “Positio” or summary of the documentation relating to the merits of the individual’s cause. The “Positio” is then subjected to an examination by nine theologians, and if a majority of them view the “Positio” positively, it then goes to examination by cardinals and bishops who are members of the CCS. If the latter group is favorable to the cause, the head or “Prefect” of the CCS presents the entire cause to the Pope. If the Pope then approves the cause, he authorizes the CCS to draft an appropriate decree, which eventually is read and promulgated. Apparently during this process the CCS may submit certain issues to the CDF, which has 23 members (cardinals, archbishops and bishops), 28 consultants and a staff of 47; the CDF is headed by Prefect Cardinal Gerhard Ludwig Müller. Under the previously mentioned Apostolic Constitution the CDF is charged “to protect and safeguard the doctrine on faith and morals . . . in things that touch this matter in any way” (Art. 48) and to help “the bishops, individually or in groups, in carrying out their office as authentic teachers and doctors of the faith, [including] the duty of promoting and guarding the integrity of that faith” (Art. 50). I assume this must have happened because the Pope stated that the CDF had blocked the beatification process for lack of proof of Romero’s ‘”prudence,” one of the required cardinal virtues for such status. Subsequently the cause was again referred to the CDF apparently on complaint by certain Latin American cardinals who demanded a study of Romero’s concrete pastoral actions. Thereafter the cause apparently was neglected and stalled. Third, the Pope said the blocking of the process by the CDF had been removed and there were now no doctrinal problems, but it is not totally clear when, why and how that happened. Apparently, as just stated, it was a decision by Pope Francis himself in April 2013, but details are lacking. Fourth, the Pope said that he wanted clarification on whether martyrdom in ‘odium fidei’ (out of hate for the faith) is for confessing the [Roman Catholic] credo or for performing the works that Jesus commands us to do for our neighbors and that theologians were now studying this issue. It, however, was unclear as to whether this was being done by the CDF or the CCS. In either event, another commentator said that official martyrdom traditionally has been limited to those who were killed as persecution for their Catholicism. Indeed, this is the traditional test known as ‘odium fidei’ (out of hate for the Catholic faith) while death for the cause of Christian justice—sometimes called “odium iustitiae”— is currently a subsidiary test and potentially could be established as an alternative formula to prove martyrdom. Fifth, the Pope’s recent comments made it very apparent that he supported Romero’s beatification. 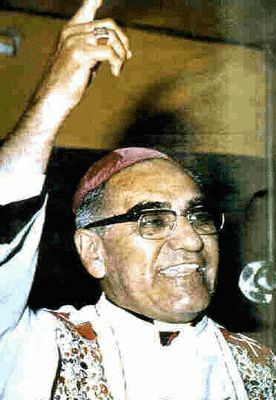 He called Romero “a man of God” and said that it was “very important, [for the postulators] to do it [their work] quickly.” I also thought the Pope impliedly endorsed the idea that martyrdom includes performing “the works which Jesus commands with regard to one’s neighbour“ (“odium iustitiae”), which is exactly what Romero was doing and why he was assassinated. Indeed, during his brief time as Pope, Francis has repeatedly discussed Romero and his beatification with visitors. Just after his inauguration, he “received several guests who took up Romero with the new pope, including the Anglican archbishop of York, who handed Pope Francis a “Romero Cross.” Francis met twice with the Argentine Nobel Peace laureate Adolfo Pérez Esquivel, and they discussed Romero and the desirability of a positive result in his canonization process. “[That] same topic . . . took center stage in . . . meetings with then Salvadoran president Mauricio Funes, with his successor Salvador Sánchez Cerén, . . . with the President of the Central American Parliament, who Francis assured that the canonization is ‘on the right path’” and when this May the Pope met with a delegation of Salvadoran bishops. Moreover, Romero’s message seems to fit the themes of Francis’ papacy, especially the emphasis on the poor from a son of the Latin American church. I have written many posts about Romero, some of which have concerned the beatification process. Beatification is part of the Roman Catholic Church’s process towards sainthood. It recognizes the person as someone who has lived a faithful or holy life. After beatification they are known as ‘blessed’ and can be venerated by Catholics but, unlike canonization, it is not required. Upon a grant of beatification status, a separate process for canonization commences. This discussion of the Pope’s recent comments is based upon the following: Francis: “Romero is a man of God,” Super Martyrio (Aug. 18, 2014); Pope Francis’ Flights Yield Candid Conversations, N. Y. Times (Aug. 20, 2014); Palumbo & Cave, An Obstacle to Honoring an Archbishop Is Removed (N.Y. Times (Aug. 20, 2014); Borkett-Jones, Should Romero Be Canonized? Pope Francis Seems To Think so . . . ., Christianity Today (Aug. 19, 2014); Pope lifts beatification ban on Salvadoran Oscar Romero, BBC (Aug. 19, 2014); Lawler, The cause for beatification of Archbishop Romero: BBC botched the story, Catholic Culture (Aug. 19, 2014). Rutilio Grande was a Salvadoran priest and a friend of Romero who was murdered in 1978 for his vocal advocacy and actions to support the interests of the poor people of his country. In May 2013 Pope Francis reportedly told Salvadoran President Funes that Grande also should be beatified. This account of the two congregations is based upon the English language summary by the U.S. Conference of Catholic Bishops. Amplification and correction, especially on this account, from others more knowledgeable on this subject would be greatly appreciated. This summary of the history is based upon Pope Greenlights Romero Beatification, Super Martyrio (April 21, 2013); Who “Blocked” Romero’s Cause, Super Martyrio (April 29, 2013); Clear path for Romero at CCS, Super Martyrio (Nov. 22, 2013); New push for Archbishop Romero, Super Martyrio (April 25, 2014); Saint Romero in two strokes, Super Martyrio (May 5, 2014); Front row with Francis, Super Martyrio (May 30, 2014); Romero in the age of Francis, Super Martyrio (June 29, 2014); Francis: “Romero is a man of God,” Super Martyrio (Aug. 18, 2014). Super Martyrio is a blog created and maintained by a Salvadoran-American lawyer in California to follow news about Romero in support of the cause for Romero’s beatification and canonization. Muchas gracias! Jubilation in El Salvador by Pope announcement on beatification of Archbishop Romero, La Pagina (Aug. 19, 2014). Duane, thank you for this analysis; it is more complete and more accurate than any I have seen with regard to Romero’s cause–and I have read just about everything I could get my hands on! One minor quibble: I don’t think that when Pope Francis said that Romero’s process had been “blocked for prudential reasons,” that he meant that the CDF had blocked the beatification process for lack of proof of Romero’s prudence. Rather, when he said that it was blocked for “prudential reasons,” he was referring to the prudence of the CDF–that when the CDF considered the prudence of proceeding or not proceeding with the process, they thought the better part of prudence would be to let some time pass to get a cooler reading on the prickly issues. Generally, when beatification causes require delicate analyses of live political controversies, the system response is to delay, usually in deference to the preferences of the home diocese to allow the dust to settle and for expert and scholarly opinion to coalesce regarding the moral and theological implications of a particular conflict. WOESTMAN, Canonization: Theology, History, Process (St. Paul University, 2002) at 58. This is what apparently happened with Romero after the CDF received two consecutive objections from the Cardinals as you describe. [There may have been other objections–for example, I have heard that Salvadoran conservatives may have filed petitions with the CCS, akin to the “amici curiae” processes that we have in U.S. civil courts, arguing against the beatification.] Accordingly, the blockage would have prevented the CCS from proceeding to any analysis of Romero’s prudence and other theological virtues—–and not been caused by any perceived deficit regarding Romero’s own prudence or any other virtue. The blockage would operate to preclude any specific discussion or adjudication of those issues, similar to when a U.S. court “abstains for prudential reasons” (such as comity or some other consideration that is not obligatory but discretionary) from hearing a case. Carlos, thank you for your clarification or correction regarding the “prudence” issue. Your more extensive and intensive coverage of the Romero cause is extemely valuable. Muchas Gracias! Tim Johnson, Latin America Feeling “Francis Effect,” Portland Press Herald (Oct. 4, 2014), http://www.pressherald.com/2014/10/04/latin-america-feeling-francis-effect/. Such a beautiful article. You can also read : http://bit.ly/1IjoK9I .The push towards fundamentalism within the world’s religions required co-opting the church leaders, as well.Some of the furthest right Catholic groups in Central and South America, like TFP, were being covertly funded by RevMoon. My own mother was caught up with the group’s outreach to catholics here in the US and became politically radicalized beyond recognition.